Intel has already launched several new SSDs and more are coming. Detailed information on the new business solutions Intel 710 and 720, where it uses both SATA and PCI Express. Among the specifications we find over 2 GB/s read speeds and 180,000 IOPS. Intel 710 series, code name Lyndonville, appeared back in April, but only a suspicious launch date and that the units would use MLC NAND flash in a 2.5″ SATA format. The SSDs comes with 64MB DRAM cache and really long lifespan. Intel 710 has to settle for SATA 3.0 Gbps and at 100GB, 200GB and 300GB capacity it offers read speeds up to 270 MB/s and write speeds up to 210 MB/s. IOPS performance is not very impressive at 36,000 IOPS at read and 2,400 IOPS at write of random 4K filer. Intel 720 series first appeared in April on the roadmaps, code name Ramsdale. With a PCI Express formfactor it is the first for Intel and with 34nm SLC NAND flash and PCI Express x8 interface performance is impressive. Intel says that it will reach 2,200 MB/s at read and 1,800 MB/s at sequential write. At read of random 4K files performance peaks at 180,000 IOPS and drops to 56,000 IOPS at random 4K writes. Storage capacity is 200GB and 400GB, and Intel specifies a durability of 36 petabyte for the 200GB model. 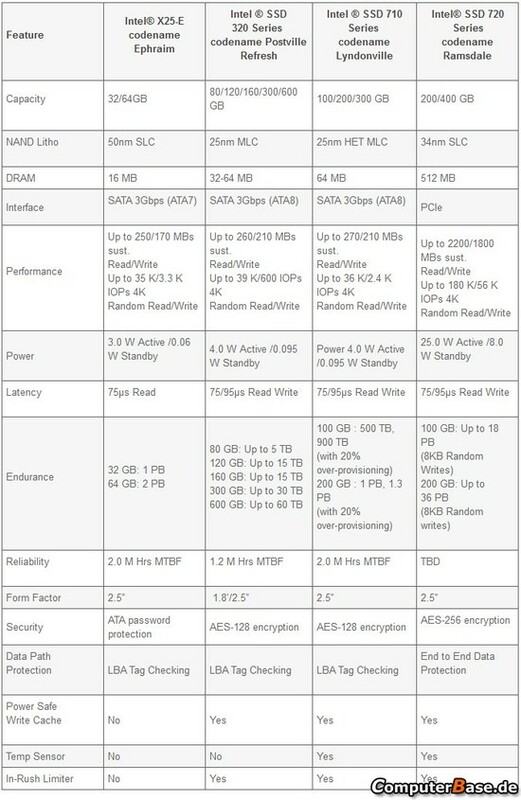 The launch of Intel 710 and Intel 720 are slated for Q3 2011.